This is Ace Hotel&apos;s most polished and mature hotel to date, with Bauhaus-inspired design utilizing plywood, formica and unlacquered reflective surfaces to bounce off ample natural light. A more elegant, if still masculine aesthetic than you might expect if you&apos;re familiar with the brand&apos;s other locations in Pittsburgh, New York, Portland or LA. Cultural Engineer Claire Henry describes it as inspired by what Mies van der Rohe might design today. Local artists and craftsmen and women are prominently featured throughout the public spaces and guest rooms. Horween Leather Company, one of the oldest tanneries in the country, did leather banquettes for 7th floor rooftop bar, Waydown, and finishing touches in guest rooms. Commissioned pieces by local and emerging artists, including the Lake Michigan-inspired bronze sculpture behind the check-in desk, were curated by Volume Gallery. The ground floor gallery space currently features 159 art pieces on Ace Hotel stationery by School of the Art Institute Chicago students and recent graduates. The students were all paid for their work, and after the August 31 closing reception, these pieces will be permanently displayed in guest rooms. Most rooms have either a turntable with locally sourced vintage records, or an acoustic Martin guitar and every room comes with a bluetooth Tivoli radio. 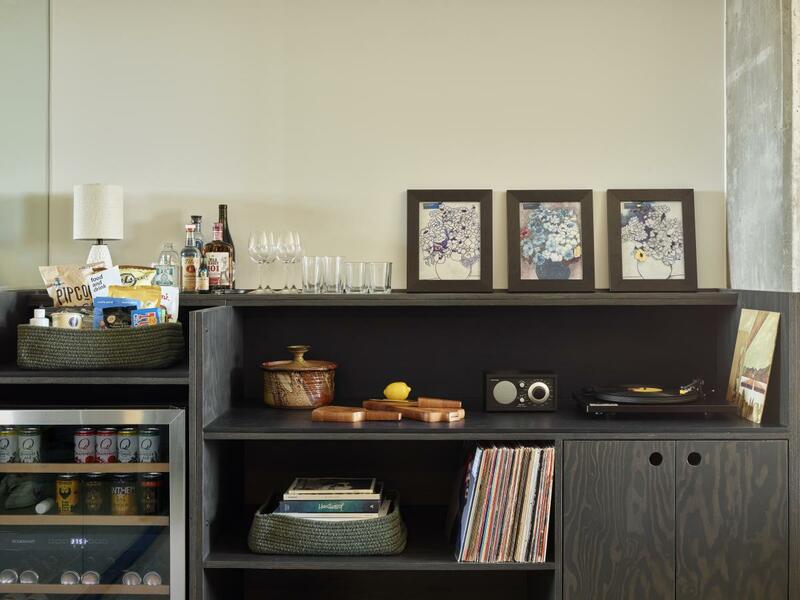 The well-stocked mini-bar (seriously, you could survive for a week off all the food and booze) includes local treats like Terry&apos;s Toffee, Veruca Chocolates, a stick of pepperoni from Publican down the street and Koval gin. Locals are encouraged to hang out here. There&apos;s tons of co-working space in the lobby and free WiFi is available even if you aren&apos;t a hotel guest. The rooftop bar will have DJs playing music every night in a custom blue sand and resin DJ booth and a 5th floor prairie terrace will host public events as well. 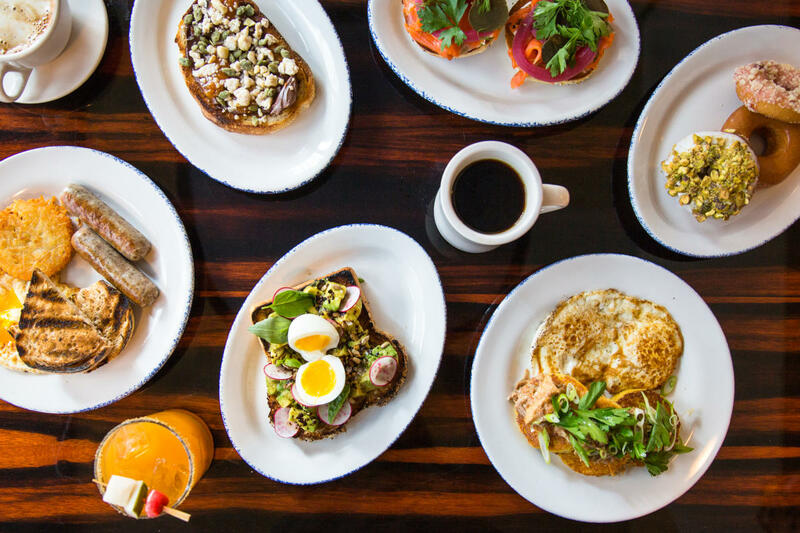 City Mouse serves brunch and dinner every day and you should dine on the patio while you can. Chef Pat Sheerin runs the kitchen in collaboration with the team from Giant in Logan Square and standout dishes include the peach and farro salad and smoky chicken with cashew rice. Many of the herbs and radishes are coming from the hotel&apos;s own urban rooftop farm, in partnership with The Roof Crop. The Ace officially opens August 10th, but during the soft opening preview period, 10% of proceeds from all reservations, totaling $25,000, was donated to three community partners: Young Chicago Authors, Little Black Pearl and 826CHI. All three programs support Chicago youth in art, writing and enterprise. We love seeing an out-of-town brand truly support and celebrate our local community. Check out the Chicago hotel map to find properties all around the city, or search by location — here are 20 Chicago hotels that are close to everything. Did you know there are over 40,000 hotel rooms in the Central Business District? Browse hotel spotlights on the blog for more insider guides.